3D QuickTools Ltd., a the leader in 3D die design automation and Strategic Technology Solutions, has released the SP2.0 of 3DQuickMold 2014 - is a professional plastic mold design solution that helps solve very complicated plastic mold design problem. 3DQuickMold follows the industrial practices and use the same workflow in mold shops. 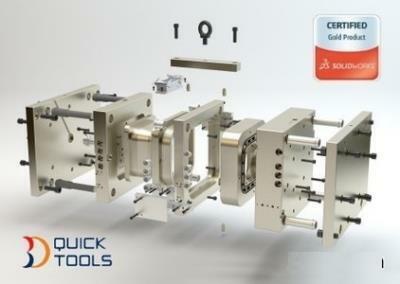 The ease of use and powerful mold design capabilities have been verified by the early users of 3DQuickMold. With the introduction of 3DQuickMold in the market for less than two years, 3DQuickMold is leading in market acceptance and growth rate in the market. 3DQuickMold makes itself stand out from the competition in the mold splitting functions and the ways it guides mold engineers to complete the design task with flexible workflow and high level of performance.